Let me first say that after having an aunt give you access to a lovely hotel in a city you plan to visit, it might behoove you (if you at all can) to be friends with a food photographer who lives in a city you are about to visit. It helps. When I came in December, Helene kindly emailed me a list of some of her favorite restaurants as suggestions for me while I was in town for the workshop. My first night there I had dinner at Carolina's, a short walk from my hotel, where the loveliness of my meal was almost surpassed by the uniqueness of eating it on my own. You probably think I can't remember what I had all those months ago, hmmmm? Oh! But I do! I'd have it again in a heartbeat. I often pull from the appetizer menu and eating alone this seems to make especially good sense: I had clams with a leek fondue, cannellini beans and tomato broth along with a roasted beet salad complete with bacon lardons and a poached egg. All of my favorite food groups. But enough about me. When we got to the Mills House Hotel this visit, it was still pretty early. Tea time, perhaps? Cocktail time for sure. We dropped our bags in the room and headed down to the Barbados Room for some nosh. It was pretty enough outside that we ate in the courtyard by the fountain. Neel and Callum had She Crab Soup (Cal loves him some She Crab Soup), and I had shrimp salad. 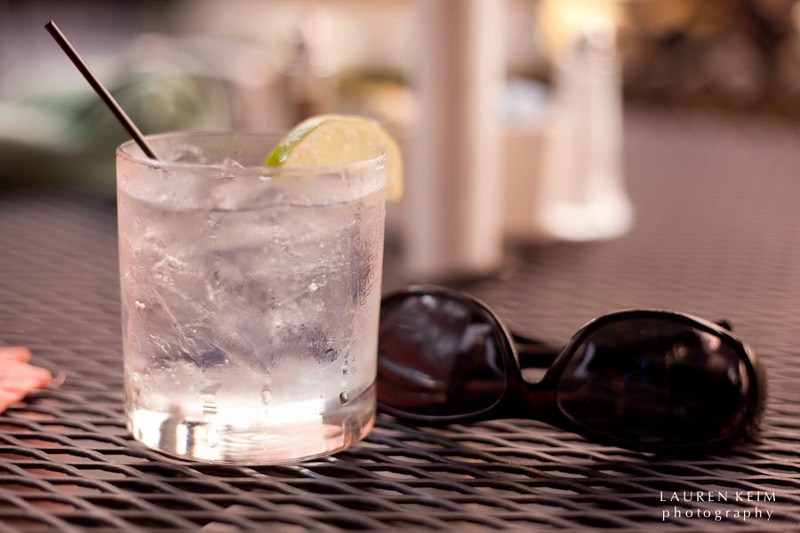 Of course I had a gin and tonic too. Dinner was nothing fancy. We needed something simple and fast to calm the savage beast that is the 12 year old boy. Local brewery. Unexceptional service. Callum had She Crab Soup (again). Neel and I split a flight of beer samplers. Beer is good. I had a lovely little plate of roasted garlic, flat bread, warm brie and a compote of spicy tomatoes and onions. Definitely gonna try that one at home. For lunch the next day, we consulted Helene's list. And chose this. What the what? This my friends, is the kitchen at Slightly North of Broad, or SNOB. When we got there, we were offered the option of a regular table or eating at the chef's table facing the kitchen. My son opted for this choice, and it was brilliant. When we did our highs and lows of the trip, this meal ranked right up there among my highs. Although we couldn't completely see into the kitchen, we were right there and could feel the palpable energy that comes out of that kind of creative mayhem. It was awesome! I have to be extra careful with cocktails in general (headaches) and especially during the day, but hey! We're on vacation! Neel had an amazing margarita, and I had something called a Barn Raiser: honey infused bourbon, Blenheim's ginger ale and orange bitters with a twist. Yeah, it was pretty awesome. We started with mussels, but after that things were hit and miss, food wise. Strictly operator error. Callum was making a real effort to be brave with his food choices (and he's not a picky eater, by any stretch), so he tried the fried chicken livers. No go. Neel had drum, which is a fish, so he switched with Cal, and I didn't really like either. Fortunately my beef carpachio was awesome. I shared with everyone. Neel, who does not have a sweet tooth, surprised us by ordering dessert. As you may know, I'm not a fan of cooked fruit, but this was pretty lovely. For me, the most important part of a cobbler is the crust. This crust was pretty okay. Understatement. But by far the best part about lunch at SNOB was watching Callum unfurl his interest in his camera. If I took a picture of our lunch, he took a dozen. We'll talk more about this, I'm sure, and his post about Charleston is coming up next week, but I'm so excited that he's excited. I'm hoping this is something we can share for a long time. And if not? Well, we had fun in Charleston, and that chef in the kitchen got a kick out of us too. On to dinner! (Who else plans their vacations around meals? Come on, it's not just us!) I knew I wanted us to go to Lana (also pictured at the top of the post) for our last night in town, so Neel made reservations for Friday night. I don't know if we're messing Callum up or raising him right, but like us, he loves eating out (and nice hotels!). Still, we've done this often enough to know that when you're feeding kids, no matter how sophisticated their palettes, early is good. After a roundabout walk to get there, we walked in the door just after six as the place was starting to fill up. Callum had tonic and lime first, then Sierra Mist (sprite), but Neel's cocktail was the best. Called the Velvet Whipping Post it consisted of Guinness, Espresso Vodka and sparkling wine. So smooth and delightful! When he brought Neel's drink, our server said he'd been skeptical about it at first so he had one... then he had five. Neel had steak, Callum had rockfish, and I had the most divine scallops (again off the appetizer menu), but the best part of the meal was the antipasto platter, hands down. Nothing, except maybe the duckfat fries, compared to that platter. This was truly a delightful meal and a delightful experience. Helene (whose photos grace the walls of the restaurant) is friends with Chef John Ondo, who is an attentive presence at the table. 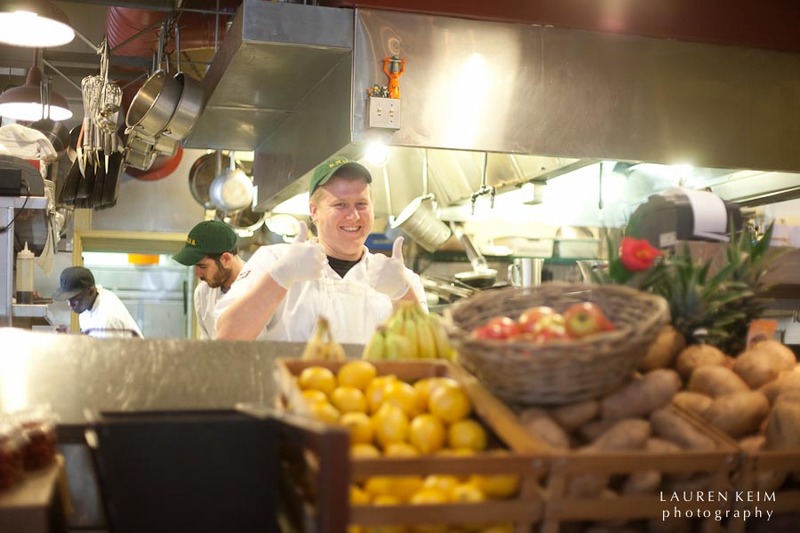 Our own server took great care of us, but having the chef bring your dinner and check in on you definitely makes you feel well cared for. The atmosphere is warm and relaxed, and the pace is decidedly Southern: unhurried. 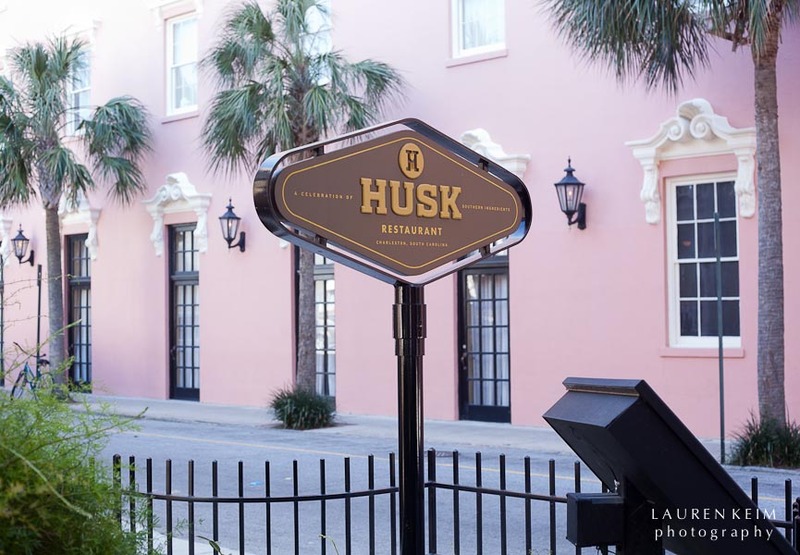 Our wonderful concierge at The Mills House told Neel that Charleston really became a foodie city within the last 10-15 years, and Husk is a perfect example of all the best that the city has to offer. Just across the street from our hotel, we met our friends Megan and Jon here for lunch on Saturday. We were lucky to get in. Another person at our hotel told us that it took her a week and a half to get reservations, for lunch, and as we stood outside waiting for our table we saw group after group take a glance at the menu, pop inside planning to eat and pop right back out again. No room at the inn. Named Bon Appetit's Best New Restaurant in 2011 with a chef who was recently featured in The New Yorker, our experience and meal at Husk was everything I've come to expect at a Charleston eatery. Gracious and delicious. Warm buns with honey butter and delightful attention from our server who seemed genuinely interested and pleased to hear where else we'd been eating during our stay. Their menu changes daily, and Husk is big on the pig (as was evidenced by the Bloody Mary with cured ham I showed you in my Monday Mash Up!). We shared two appetizers: bruschetta with pimento cheese & ham and pigs ears lettuce wraps. You read that right. Served on fluffy leaves of Boston lettuce with braised cabbage...I. HAVE. NO. WORDS. Sooooo good! One thoughtful note: each appetizer came in a set of five, which was the number in our party. So many times we've eaten out with these guys, sharing tapas or whatnot, and had to figure out how to divide a serving of three...this was a nice way to do it. Callum, as you know, was on a kick of being brave, and this time it paid off. He had the crispy duck leg and loved it. Neel and Megan ordered one of the few menu staples: Shrimp and Grits (which I'm thinking I want to try to make sometime), and when I heard that the chef was working to perfect fried chicken, well, I had to try the fried chicken BLT. It's not pictured because it went too quickly into my tummy. Nom. Nom. Nom. Can I pick a favorite? Don't make me! The Barbados Room had that elegant sink-into-vacation feeling coupled with gracious old South. My meal and cocktail at SNOB was awesome even though Neel's and Callum's weren't so (bad choices). SNOB was more about the atmosphere of sitting at the bar and feeling the energy of the kitchen right in front of us. That, and Callum getting excited about the camera. Lana had that antipasto platter and the Velvet Whipping Post along with the wonderful attentive service. 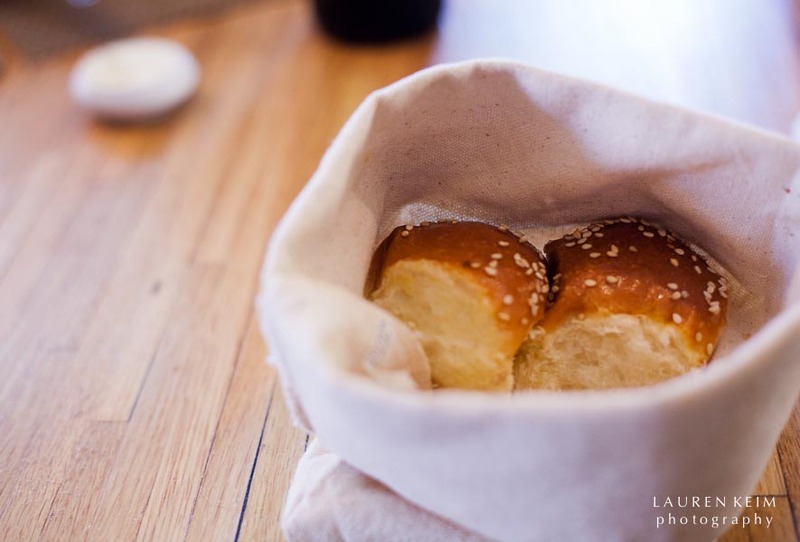 Husk was all about atmosphere, from the joggling boards on the front porch to the warm rolls served in burlap bags. Phenomenal food doesn't hurt either. We didn't go wrong at any of them. More please.